Owning less goes a long way in organizing a home. The formula is very simple and you might even know it already. 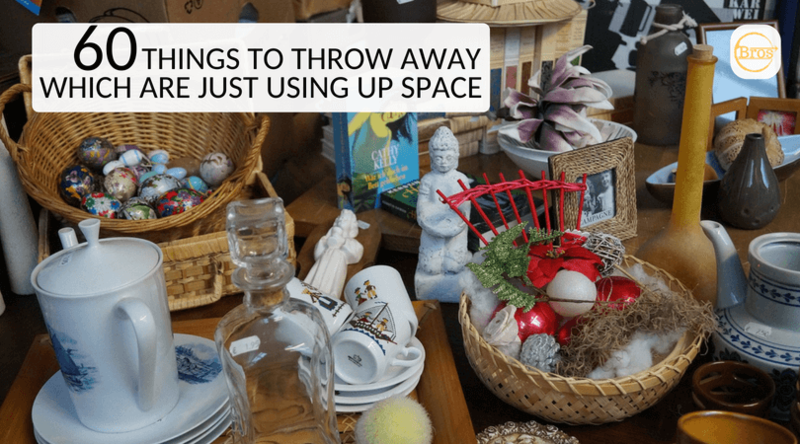 It’s decluttering – getting rid of unnecessary items. Doing this simple thing will bring about a great difference making your house more liveable. It also saves you time which otherwise is spent on cleaning and maintaining the things which you really don’t need. There might be many things in your house which you have either just kept with the promise of using them someday or are simply lazy to throw them out. 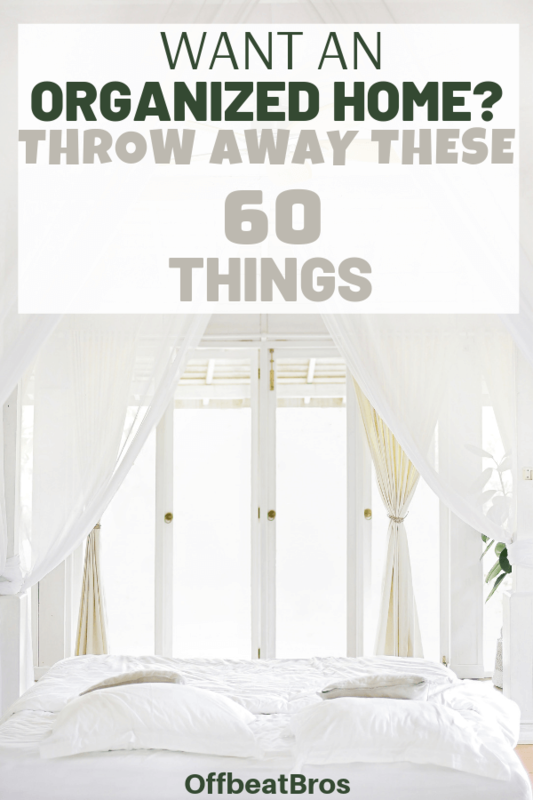 So here is a list of a few things which you really should throw away. You can even donate or sell some of the things on this list. Now, decluttering can be a difficult task and it might happen that you are not able to throw all the unwanted things at once. That’s completely fine. At least start the process with a few things and make a habit to throw some of these things every day. Make a true promise to yourself! As a result, you will successfully throw away all the unnecessary and unneeded things within a couple of days and make your house clutter-free. I’m guilty of preserving old bills. And honestly, they are of no use and just takes unnecessary space. So, get rid of all the old bills, receipts as they are of no use. If they have been paid, they don’t need to be stored. Throw away the bill of products that are out of warranty as they have no value now. I usually make it a point to check for this every 2-3 months and throw away unnecessary bills. Also, sign up for electronic bills and receipts, this will prevent future clutter and also save paper. Why do you need to keep those socks with holes or socks with worn out fabric? Digging deeper, you might even find socks, where there is only one from the pair. They are just clutter and taking up unnecessary space. Do you really need these in the era of Smartphone, USB drives, and portable hard drives? Transfer the files to them and say goodbye to CDs and DVDs. You can also make something out of these disks. Here are some of the DIY projects you can make using old CD’s. You should get a new toothbrush every 3-4 months for good dental hygiene. After getting the new brush, don’t keep the old one, just throw it away. Never ever you should keep expired medicines in the medic kit. Expired medicines can do more harm than good for you. Throw them out to prevent the risk of consuming them by mistake. To dispose of them properly, put them in Ziploc bag before making its way to the trash can. This will prevent any leakage or spillage. If thinking of using expired makeup, then note that it can damage your skin. There are good chances of side effects. So what is more important? Saving some dollars or saving your skin? Well, memories! I won’t tell you to throw them but they are clutter nevertheless. If you have old toys, which you think that nobody will use, you can donate them. Instead of just catching dust in your storeroom, they can have a good time with someone (pun intended). Donate them to a local orphanage or at Goodwill. Throw your old and worn-out shoes. If you haven’t worn your old shoes much and if they are in good condition you can donate them to places like Soles4souls. The hangers in which your clothes are on when you receive them from dry cleaners are not good for your clothes. They corrupt the fabric, deteriorate the condition of your cloth in the long run. Opt for wooden, steel or good quality plastic hangers. Chopping on plastic cutting boards cause scratches and deep cuts on the board over time. Bacteria accumulate in these lines and are very difficult to get rid of as they start growing. Using wood cutting boards is way better than plastic boards. Even if the bacteria enters these boards, it dies instead of thriving. Spices which are just occupying the space in your cabinets for years won’t add any flavor to your food. Since you are not using them, they can’t fulfill their task of adding flavors to the food. So, the best thing is you should throw away the spices which you have not used since years. Related: Kitchen organization hacks to keep your kitchen super organized. The past days are gone! They will never return. So let that old calendar go from your house. Old paints lose their quality and are not that effective. If you use them, you will never get a good finish. So no point in keeping them hoping to use them later. Well, what can I say it’s self-explanatory. What will you do of so many boxes? If you think they are very useful to you, keep them after making a promise to use them. Not to mention that you get a new box with most of the new products you purchase depending on the product. You must have kept them as memories, but remember someday they have to be apart from you. And nowadays, we have so many digital gadgets, so you can take a picture and kept with it you without sacrificing your home space for it. If you kept your old and unused perfume with the thought of using it someday, then think twice. You have not used them in these years. So will you really use them? Since the food is expired, it should not be consumed. So now if the food cannot fulfill its sole purpose, what’s the use of keeping it? There are games which can’t be played without some parts that go missing. If you cannot find these parts then these games are of no value. You cannot apply dried nail polish on your nails. So why you still have kept them? If you are not wearing your artificial jewelry, give it to someone who is willing to use them. Keep some of the old newspapers as these are required for many purposes. Throw away the rest. You can use old newspapers to clean windows. Most of the times, we buy new party supplies for the next party ahead. Even if we use, we pick up some of it. So narrow down the number of your party supplies. Dump them off or give to someone who needs it. IF you haven’t planted something in it, then why have you kept it? Make something out of them or donate them. It can be used by some needy. Keep the one you use and donate or gift the rest. Ask yourself, ”Will you ever use the used covers again?” I will never use it again. If your hair ties are too stretched out to use, they are ruined and of no use. Throw them away. Donate them! Children who love them can have a good time. You should throw the candles which your eyes hate. You have read those books, so you must be knowing the recipes written in them. So why do you need them now? Used batteries are of no use. Dispose of them properly. Batteries such as lithium ones can be recycled. Recycle them. Some shops do offer money in exchange for these bottles. The ceremonies which these invitation cards are meant for are already wrapped up, that time won’t come back. Are you likely to put up the old posters back on the wall again? The chemicals that block the sun and protect your skin break down with time and thus, fail to guard your skin. So no matter, how much apply it, your skin won’t be protected. In fact, using expired products may lead to side effects. Make the way to the dustbin for your old or expired sunscreen. I know that the gift cards from your loved ones are very precious to you. Take pictures and try to eliminate the very old ones. Everything has an end some day. And you might have just kept it in some of your storage away from your eye for years. You have finished reading them. Let someone else gain some knowledge. Donating things which can be used by some need is not at all a bad idea. You must have kept your favorite magazines which are very old so that you can it again someday. But 99% chances are you will never bother to read it again and have let it just occupy the space in your bookshelf. And it’s of no use, as you have already read it once. Make something using them or the option of recycling is always available for you. You don’t need to keep your year’s old chargers as we live in the era of technology. The charging technology is changing rapidly and that 10 years old charger wouldn’t even fit your lately bought smartphone. The contact and other such details of some business organization can change with time, so that old card will never lead you to that organization. Even, if the details have not changed you can get a fresh card. Dish-cleaning sponges get dirty very soon and are the breeding ground for bacteria. They need to clean frequently and replaced every few weeks. Use WD 40 for removing the rust from iron tools. WD 40 has amazing household uses. These are some of the common things which clutter your home that you can throw away. You might have other things in your house which are of no use to you. So find them and do something of them. What are you planning to throw away? What all have you included in your list from the above mentioned things? Keep your home organized by throwing away clutter, and don’t forget to share the post!